Once upon a time, HIM directors were perceived as the queens of medical records. They ruled over kingdoms of transcriptionists, coders, billers, and other front-line staff members to control document quality, manage turnaround time, and monitor costs. Those were their priorities—in that order. This was the critical turning point. Previously, manual transcription represented a significant portion of the HIM empires. Today, only a small percentage of hospitals employ transcriptionists—all of whom essentially use backend speech recognition so even surviving departments are about one-half the size of yore. CFOs and CIOs began perceiving a former HIM labor function as a technology-leveraged commodity. Cost savings were too big to ignore; HIM directors could iron out the details to make it work. Priorities became cost first, turnaround time second, and quality—now sold as an inherent function of speech recognition technology—third. Vendors responded by selling less to HIM directors and more to CIOs and CFOs. And just as the outsourced transcription market became saturated and began to stabilize, another technology juggernaut known as certified EHRs arrived to further weaken the power of HIM monarchs. Sold as a government-mandated IT initiative, vendors convinced CFOs and CIOs their products would automate meaningful use and several of the tasks being performed in HIM, thus diminishing the voices and power of many HIM directors. Of course, HIM professionals didn't buy the automated document quality aspects of speech recognition or EHRs but it made no difference. That's how technology is sold and that's what CFOs and CIOs have bought—then reluctantly must ask HIM directors to fix when the tools don't deliver as promised. The invasion of these so-called labor-eliminating, cost-saving technology solutions triggered a further loss of power for HIM directors in many but not all organizations. Some vendors believe HIM directors no longer influence buying decisions—and in many cases, they are correct. Besides, why would vendors want to sell to an audience that tells them how their offerings actually increase total process costs while dangerously sacrificing quality for only incremental improvements in turnaround times? It's much easier—and more profitable—to convince CFOs and CIOs their offerings save money by eliminating labor. Reduced vendor participation at state and national HIM exhibits is a clear example of the notion that HIM directors have less authority over medical records. Through slick demos that begin with "Once upon a time" and conclude with "They all lived happily ever after," vendors have convinced C-suite executives they understand the business of health care better than HIM. To reclaim their rightful throne, HIM must correct those perceptions by fighting fire with fire. Specifically, fighting spreadsheets with spreadsheets. Regrettably, when outsourced service and technology vendors sold CFOs and CIOs on huge cost savings that relied almost exclusively on reduced in-house HIM labor, HIM directors were forced into a weakened position. But once contracts are signed and systems are installed, directors have no choice but to manage those vendors and clean up the mess. No one gets ahead by pointing out problems; they have to be fixed. Fortunately, as certified EHRs were being introduced, some of the visionaries at AHIMA saw the writing on the wall and began promoting data analytics as the future of the HIM profession. Although the scope of HIM responsibilities remains the same, the tools used to control and protect the kingdoms must keep pace with the times. If the industry must run on automated EHRs designed around spreadsheet-driven performance measures, then who knows those measurements better than HIM? Accordingly, it's time HIM stopped taking the heat for poor hospital business performance resulting from slick-looking but inefficient tools. It's time to stop allowing vendors to dictate how HIM directors operate their systems instead of delivering systems that meet operating needs. It's time to document the true organizational costs and real-world quality implications of deficient tools or services and simultaneously propose more cost-effective solutions. Bottom line: It's time to make underperforming vendors reassess their relationships with HIM. When preparing for a conflict, it's important to control the battlefield. That's what unscrupulous vendors did when they shifted their HIM technology and service-related sales efforts away from HIM directors and into the C-suite. Vendors that successfully pitted HIM against IT by sacrificing labor costs in favor of technology expenses are the ones that need to be targeted. They've orchestrated the fight over the past few years by convincing CFOs that the deciding factors had to be cost first, turnaround time second, and quality last. Moving forward, HIM needs to return priorities to their proper order by demonstrating to CFOs how the true total organizational cost is much lower when quality is the number one priority. Remember all that talk about how Six Sigma/lean training promotes strict quality measures to improve full process efficiency and reduce overall costs? In contrast to what some vendors may have promised, processes can't be fully automated or placed entirely on the shoulders of the physicians. All that does is increase and shift costs to another part of the organization. Here's where experience and expertise with full workflow processes comes into play. Take the example of a large university hospital where the in-house transcription staff was promised the vendor would cut labor costs in half with back-end speech recognition, which was delivered in compliance with specific terms added to the contract at the insistence of the CFO. The problem was even though staff was reduced by 50% as promised, the fully loaded labor and technology cost actually went up by more than 15% due to all the fine print. Yet just because HIM directors can point out where savings and quality were not achieved doesn't mean things will go back to how they were. That ship has sailed. What HIM directors can and should do is hold vendors accountable. In the example of the large university hospital, instead of focusing only on the labor, the math should have been calculated for the entire solution. Five years later when the contract came up for renewal, the hospital switched vendors and achieved the desired savings, but in the meantime, HIM had to correct an error caused by a CFO who paid attention to only what the vendor said to focus on. 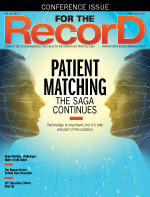 The situation has led some physicians to turn to scribes to help alleviate the demands of document creation in a certified EHR environment. Of course, EHR vendors can't suggest a return to transcription, which is typically cheaper than scribes, because that would mean admitting their original sales pitch was off the mark. Vendors realize HIM can see through their shell games. That's why they started selling to CFOs and CIOs based on one or two financial bullet points while avoiding HIM like the plague. HIM directors understand the entire process and how each component impacts key performance indicators (KPIs). Those who take on vendors on a single data point will likely lose that battle. To regain the crown, HIM directors must demonstrate their command over the entire process. By changing the battlefield to the entire clinical documentation process and spotlighting the downstream impact on KPIs and physicians' time vs one or two financial data points, HIM directors can successfully influence any service being sold to the CFO. In fact, the HIM directors should be leading the vendor selection process. While some services deliver outstanding cost-effective results, the risk is that if HIM does not lead the evaluation and specify the performance expectations, total process cost and quality may suffer. As the industry evolves, business goals should drive the selection of technology and services. Slick-looking demos that promise savings for a specific stage of the overall workflow must be evaluated for their impact to overall process costs before a contract is signed. Force the issue by insisting on contract cancellation clauses if KPI performances deteriorate below previous levels. HIM performance is judged by those measurements; so too should a vendor's. If a vendor won't agree to those terms, it's time to look elsewhere. Fewer vendors at the AHIMAcon and state conferences is a direct reflection of the industry's respect for the HIM community. Neither AHIMA membership nor the responsibilities of HIM directors have shrunk but exhibit hall attendance has decreased because vendors have convinced CFOs and CIOs they understand the business of health care better than anyone else. Instead of conceding these battles, it's time for HIM directors to collectively storm the C-suite ivory towers, data analytics in hand, and reclaim complete command. In 2018, vendors will continue trying to define organizational needs based on the limited scope of their offerings. AHIMA members need to stay focused on the big picture and show loyalty to those who have shown loyalty to them—those who truly recognize, respect, and serve HIM needs. Anyone who avoids HIM should pay a price. HIM directors can make that happen by being proactive through full process analytics instead of being defensive based on their limited focus.